What Is ‘Closing the Bones’ and Who Is it For? The Closing the Bones (CtB) ceremony, aka Rebozo massage, is a deeply nurturing treatment that focuses on abdomen and hips (and upper body if wanted) -- areas left out in most other types of massage -- , and that can additionally incorporate Rebozo (i.e. woven cloth) massage techniques for the entire body (shoulders, torso, back, hips, full arms and legs). Closing the Bones is traditionally done during the postpartum period to support women who have gone through the extremely opening experience of pregnancy & childbirth (during which a woman allows another soul to take birth through her). It helps a woman to find her own self and centre again and allows any energy leakages to be sealed. Yet, it is not an exclusive postpartum treatment... Closing the Bones ceremonies can help to mark major times of transition in a woman’s life (irrespective of whether she has given birth or not), such as young girls starting their period – most women indicate to feel tremendous relief from period pains when receiving the massage on the first few days of their menstruation – , marriage, divorce or the end of a relationship, moving home, transitioning between jobs, marking the (peri-)menopause, ... And its magic doesn't end there: it can also be used to support men, women and children who suffer from anxiety, shock, trauma (sexual or other), PTSD, ADD, autism, or who feel overwhelmed or over-stimulated. The best and most lasting effects are gained by repeating the closing massage at least 3 to 6 times, but one-off sessions are also done. In several Latin American, Asian and African countries similar ceremonies are still widely practiced; unfortunately, Western countries have largely forgotten this ancient lore of supporting women after childbirth. In most villages in Ecuador, e.g., women are given this massage within 6 hours after giving birth and receive it at least 5 or 6 times in total during the first 40 days postpartum, and evidence suggests this was the case all over the globe. I know through testimonials of my own clients e.g. that in many Indian, Pakistani and Sri Lankan villages there are still women who will go round and close new mothers’ bones. In the UK there are now around 550 Closing the Bones facilitators and this number continues to grow steadily. Most of us are trained by doulas Maddie McMahon and/or Sophie Messager, who in turn have learned this ancient wisdom from Rocío Alarcón (Ecuador), who is trained in traditional midwifery, shamanism and ethnobotany by her mother and grandmother, and holds a PhD in ethnobotany. I offer this massage in the Leicester area and Midlands and have served nearly 200 women with CtB over the past few years. I am also a facilitator for the Closing the Bones training workshops (both the basic 'Closing the Bones' training and the 'Deeper into Closing the Bones' training). If you would like to train to offer this fabulous ceremony, or if you would like to organise a training in your area, please get in touch with me and we'll see what we can do, or I can get you in touch with the other trainers in the UK. Procedure – What to Expect? 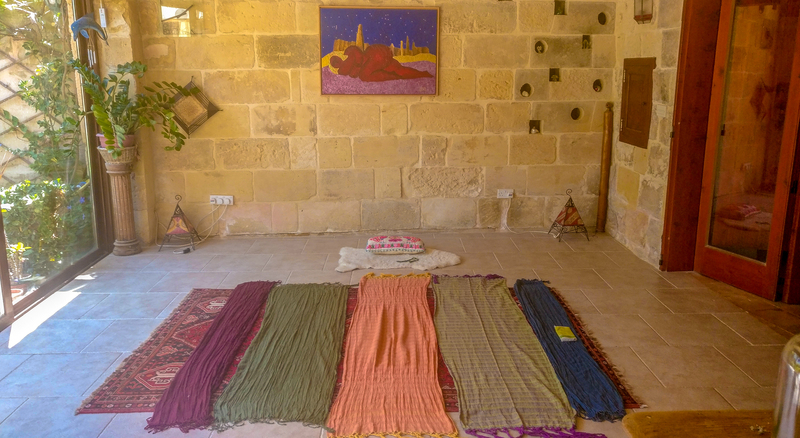 During the Rebozo massage you are fully clothed and are comfortably lying on a mat and/or blankets on the floor, supported by cushions and bolsters where needed. We always start by just chatting about why you would like a Closing the Bones and what it can do for you. 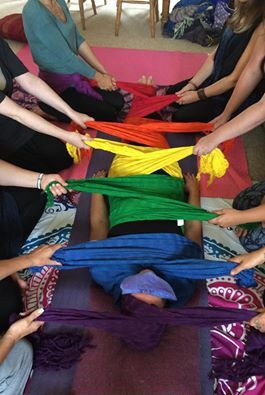 During the first option, which is the shorter treatment, lasting up to 2-hours, we start by wrapping a Rebozo (shawl) around your hips, like a hammock, and gently rocking your hips in a distinctive rhythm – a process we call ‘sifting’ – , allowing the lower vertebrae to be released and allowing mobilisation of the pelvis and hips. We take our time for this process, and with all steps of the Closing the Bones you as a client are in control and get to decide the pace, rhythm and intensity of the movement and touch. The sifting is followed by a gentle but firm abdominal massage which works from your pubic bone up to your ribs. I use a nourishing oil with a blend of warming essential oils for this massage to treat aching muscles and joints while relaxing the mind through the aromatherapy. The focus during the abdominal massage is to remove tension in the uterus and bladder, bring the organs back to their original position, and work into the hip bones, thus releasing blocked and stagnated energy. The massage includes the breaking up of adrenalin crystals which have formed on the hip bones and indicate unresolved emotion and trauma. Ultimately, the massage helps to draw your energy back to your creative centre: your womb. The treatment continues with a second round of ‘sifting’ (rocking the hips in the Rebozo shawl). Finally, this Rebozo is firmly tied around your hips and abdomen to hold the uterus and bladder in place. We then continue by closing your skull/forehead, shoulders, knees and ankles as well with Rebozo shawls. I cover you up nice and warm and give you a lavender eye pillow to allow even deeper relaxation. Once ‘closed’ you are able to lie quietly as long as you wish or need while gentle music can play. Emotional release is possible and I will hold the space for you to go through this. The firm hold of the cloth allows you to let go and go deep inside. You decide when you are ready to be unwrapped. Afterwards we share a cup of herbal tea and a chat to help integrate the experience. In the 'deeper', 3-hour treatment, you first get welcomed with some herbal tea, and then we start by using a Rebozo or manta to rock and massage the shoulders, upper back, hips, chest, breasts, armpits, arms, wrists, hands, groin, legs, ankles and feet to release tension and stagnant energy, deeply stimulate the parasympathetic nervous system, mobilise and articulate the spine and ribs, drain the lymphatic and cerebrospinal fluids, help you breathe deeply again, open up the sacrum, and release and relax the joints and muscles. It can help with swelling and oedema. We then continue with the hip sifting, massage techniques and closing described above, but we work deeper on the uterus, to remove tightness and tension at the front of the uterus and ligaments, target the fascia and avoid fascia shortening and tension in the ligaments. We can also integrate a massage of the upper chest, breast area and arms to help with release in the fascia and lymph movement and drainage. It can also benefit your milk production (this can be performed with a bra kept on if you prefer). You are then wrapped up as described above for the 2 hour treatment, and we finish with herbal tea and a chat. Especially for recent postpartum mums we recommend this longer, 'deluxe' session as a first treatment, as it is really the nurturing work she will need. There is also the option for you to have a rebozo to keep after the massage. I will use this rebozo then as one of the rebozos used to massage you and bind you (for the hips). This will make it a special and lovely memento of the session and you can use it to wrap your hips again afterwards, to babywear your child, to simply wear yourself as a shawl, to meditate with, use as a table runner or on your sofa, ... The cost of the rebozo varies depending on the length and weave-type, ranging from £30 (for a 2m single-colour open weave rebozo) to £60 (for an XL 3m multi-coloured close weave rebozo), with 4 categories in between (£40, £45, £50 and £55). Several colours are available for all options. On a purely physical level, the sifting of the hips with the Rebozo and the subsequent oil massage of the abdominal area help to loosen the lower vertebrae (which have been compressed during pregnancy) and release tension and stagnant energy that has built up during pregnancy in the hip area. The technique also offers an effective way to help mobilise the pubic bone back into the correct position whilst stimulating shrinkage of the uterus and helping to move the uterus and bladder back into their pre-pregnant place. All this can prevent serious hip problems in older age (hip dislocations, hip replacements, pelvic instability, walking with a walking frame, …). The massage also stimulates the blood circulation which in turn cleans, renews and moves fluids (and may greatly help with milk supply and lochia); moves hormones, renews the immune system, tones the muscles and renews the tissues. On a deeper emotional and spiritual level, unresolved emotional tension and trauma can be released in this massage and a woman’s energy is drawn back into her creative centre: her womb. A Closing the Bones session leaves you feeling put back together, ‘sealed’, safe, nurtured and cared for by your sisters. It helps to ‘close’ a new mother energetically, after having gone through the deeply ‘opening’ processes of pregnancy, labour and childbirth, which can leave a woman feeling empowered yet also vulnerable (physically as well as psychologically and emotionally). Everything about labour and birthing revolves around opening up, but once the baby is born the mother’s body requires sealing or closing as it can be left feeling raw and vulnerable. Birth is an amazing experience but the extreme openness can leave new mothers feeling empty or ‘leaking’. The ceremony also gives a woman the opportunity to share or unburden her birthing story, should she feel called to. Learning how to Offer Closing the Bones to others? I am also an official facilitator for the Closing the Bones training workshops (both the basic 'Closing the Bones' training and the 'Deeper into Closing the Bones' training). Do you feel called to use and integrate this very sacred and devotional work professionally (you might e.g. already be a birth worker, doula, midwife, massage therapist, pregnancy or postnatal yoga teacher, ...)? Or do you maybe just want to be able to offer your near and dear ones (family, friends, people in your community, ...) one of the most nourishing and soulful gifts you could gift them? You would be joining a tribe of over 550 women (and a few men) who are passionate about nurturing women in this way -- and we make sure to give you all the possible tools to really help you connect with that tribe and feel supported by them on your own journey as bone closer. If you would like to train to offer this fabulous ceremony, or if you would like to organise a training in your area, please get in touch with me and we'll see what we can do, or I can get you in touch with the other 2 trainers in the UK. If you organise a workshop for me to come and facilitate, you can get a 50% discount on your own training fee. The workshops are offered as either 1-day or 2-day trainings, as there is a set of basic techniques and a set of deeper work (which we call Deeper into Closing the Bones). I facilitate workshops as both 1- & 2-day programs, so you can either learn all techniques in 1 weekend, or spread out your learning and first go and practice the basic set of techniques before you learn the next set (or maybe the basic set is what you keep working with forever). I will mostly run the workshops on Thursday-Fridays and weekends. You can always check for the upcoming trainings on my trainings-webpage. "After having multiple miscarriages and a hysterectomy, I went to see Japjeet Kaur for the very soothing closing of the bones ceremony. The entire process was so perfectly gentle and in a comfortable environment. There is an innate healing energy from Japjeet Kaur that was so very delicately balanced and left me feeling lighter - physically and emotionally. As someone who studies the science of the mind in relation to results, I have to say that this is one of the definite factors for my personal healing and my professional strides. On top of all of this, she has an incredible array of products and an exemplary knowledge of a work that is carried out with love and compassion. Thank you so much for helping me with my healing. I would come to you again and again!" "After three quite complicated pregnancies and three very intense labours within a 6.5 year period, my body felt broken... The bones in my pelvis area felt 'loose', my lower back just ached and my upper back hurt so much that I really struggled to hold and breastfeed my newborn. After the very recent birth of my third baby, my beautiful, close friends organised a [3 hour] 'closing the bones' session with Japjeet Kaur Ji. I wasn't cynical about the procedure but I had almost accepted that a 'creaking, clickity, achy' body was the price for my three little blessings and so was part and parcel of my future. 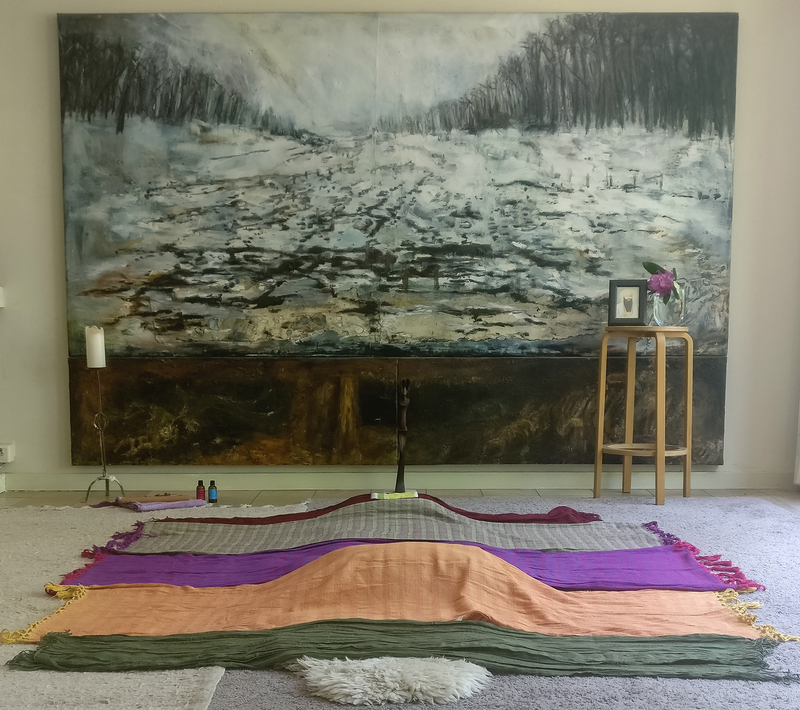 The session itself was a very nurturing, healing and powerful experience and I immediately began to slowly feel as though I was getting 'fixed' so much so that I have had two more [3 hour] follow-up sessions. Japjeet Ji listened, soothed and advised. She worked around my needs and the needs of my baby in a very caring and compassionate way. Sometimes we often wonder what to get the new baby and at times neglect the mother... we usually end up buying lots of baby clothes, which don't get me wrong is a lovely, kind gesture but sometimes we need to nurture the mother and what better present than the 'closing the bones' session. A massive thank you to my special friends for this and I will definitely be 'paying it forward' to the next new mummy friend. A very humble and sincere thank u ji to Japjeet Kaur Ji and looking forward to another session soon." "Yesterday I experienced the incredible 'Closing the Bones'. Ten years after my first out of three children was born, and after a very traumatic emotional time these last few months. The treatment was so wonderful. I felt safe, looked after, respected and nurtured. I felt how my figure was before being so stretched and now it came back, & my belly button opening even shrunk. I feel different, walk different, and am realigned. Truly recommended for all women. I feel I can reclaim the control of myself. A million thank you's. I feel even better this morning!" "You are a blessing to all women Japjeet, honestly...I'm still feeling the benefits from my 'Closing the Bones' a few weeks back. I have been on top of the world! Thank you xxxx"
"This lady, is magical, and a true, true healer, whom I have been blessed enough to be held by, in shawls, in words, and in her healing massage techniques...for any woman who is struggling with any womanly issue or trauma, I cannot recommend Japjeet at Shuniya Kundalini Yoga enough. The thought of training with this beautiful soul next year, fills me with utmost happiness and joy for the festive season xxxx"
I offer the Rebozo massage in and around Leicester. The massage is usually done in the privacy of your home, but can also be offered at my place in Leicester if for any reason it is impossible to do this at your home. Should you have small children, it is good to have a family member or friend present who can take care of them for the duration of the session. Newly-born babies can stay on/with you, and little ones can nurse during the massage if they need to – we can be flexible to and accommodate for all kinds of situations. If you would like to have your community of women around you they can take part in the final full closing ceremony. Please do not wear any perfume for the massage, as it will likely give either of us or both of us a severe headache.